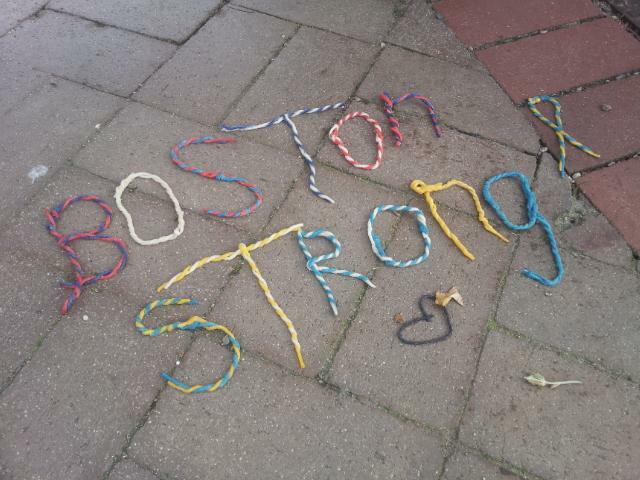 Boston Strong ! + Red Sox - Phillies at Fenway Park! - Blog from Boston, Massachusetts | Watch out USA! Boston Strong ! + Red Sox - Phillies at Fenway Park! After having gone to Harvard (oh yes, we went to Harvard !!) we headed home and changed into our Red Sox T-shirts - we were now ready for the game at Fenway Park ! It was Phillies vs. Red Sox who were playing tonight and we were all ready with our T-shirts, foam-fingers, nachos, hot dogs and popcorn ! It was a 3½ hours loooong game. And we were surprised to see, how little the other fans actually watch the game - you apparently go to the baseball games to talk with your friends and get drunk ! ;-D Red Sox won - and there weren't really any big celebration afterwards since almost half of the fans had left the game ½ hour prior to the ending !??! Weird sport !!!!! We met up with another of Niko's good friends; Else. They hadn't seen each other in 15 years, so it was really fun finally seeing each other again ! She showed us the Boston Commons, the Public Gardens and the Boylston Bombing sights. It was so weird standing where the bombings had taken place. We'd been in Las Vegas at the time when it happened and seen how the tragedy had just hit the nation… but Boston is Strong and had rebounded after the horrible events ! Boston was a really cool city though - a bit like Chicago with all the young people who attend university or college here ! Definitely a city to go back to and explore some other time ! !